Over 100 delegates at the national PE PAYS (Physical Education, Physical Activity and Youth Sport) conference hosted by the Department of Health, Sport and Exercise Science in Waterford Institute of Technology (WIT) heard that women are 75% less likely than men to get enough exercise. The gender difference in the percentage of adults meeting the recommended guidelines for physical activity was presented as a key finding of the CARDI Physical Activity, Ageing and Health Report which was launched during the two day event. 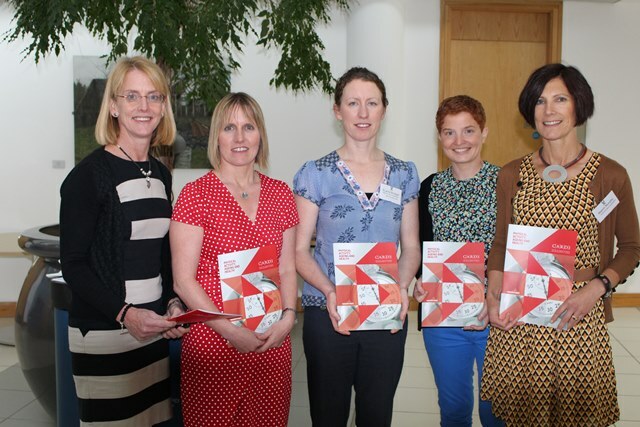 The conference, which brought together a diverse group of researchers and practitioners from across Ireland, showcased the newest research in the areas of sport, physical activity and physical education. This all-Ireland research report which was co-authored by WIT’s Dr. Niamh Murphy and Dr. Aoife Lane also found that only approximately one third of 60 - 64 year olds in Ireland are sufficiently active and several other contributors also pointed to the urgent need to address the problem of sedentary behaviour in Ireland. Dr. Sarah-Jane Belton presented Ireland’s report card on physical activity in children and youth with Ireland scoring a less than impressive D minus for physical activity. In a similar vein, the keynote address on active travel given by WIT’s Barry Lambe highlighted the decline in walking and cycling for transport among school-children in the South-East. Despite only 3% of children actually cycling to school, over 50% of them would prefer to be doing so. Encouragingly, the conference programme offered plenty of insight as to how to best address these issues. Dr. Catherine Woods from DCU outlined the political complexities of developing Ireland’s National Physical Activity Policy in her keynote address. Several senior engineers from across the South-East were enthused by the excellent case study of Smarter Travel in Dungarvan presented by Mr Tom Rogers. Mr Paul Jarvis, CEO of Health and Sport with Street Games UK, described how their project offers volunteering and sporting opportunities to the most disadvantaged youth across the UK. Interestingly the Mr. Jervis spoke about how Coca-Cola part-funds their programme. A lively debate on ‘Sponsorship in Sport’ between conference delegates, Shane Kelly (Diageo Ireland) and Colin Regan (GAA Community and Health Manager) concluded a packed conference programme. In addition to hosting the event, almost 20 staff and students from the Department of Health, Sport and Exercise Science presented their research over the two days. WIT offers a wide range of health, sport and exercise courses at undergraduate and postgraduate level. Further details on the courses offered, visit the Department's webpage.